Koons Avenue: Gold Miners from Buffalo? Koons Avenue is located in the Emerson Neighborhood of the East Side of Buffalo. Koons Avenue was named for the Koons brothers, Henry and Edward, who developed the neighborhood along with Judge Titus and Frank and Henry Goodyear. The Koons brothers, Edward and Henry, were born into a prominent Buffalo family. Their father, Jacob Koons, was a merchant, political official and a leader in church and charitable affairs. 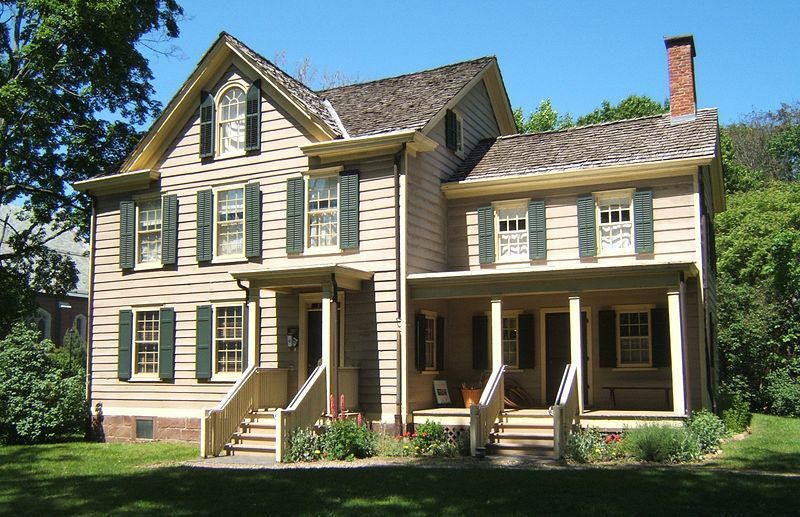 Jacob came from Europe in 1828 and became a farm hand outside of Albany, new York. He came to Buffalo in 1832 and established a store (history books refer to it as an emporium) for the sale of clocks, dry-goods and groceries at Main Street near Genesee. The store was successful and branched out to a second store in Paris, Ohio. Jacob Koons left the business in 1848. He was then involved in local politics. He was appointed Superintendent of the Poor in 1856. Jame Koons, along with his wife and six children, lived at 73 East Huron. Jacob Koons was a member of St. John’s Lutheran on Hickory Street and was involved in building and improving St. John’s Orphan Home. You can read more about the Orphan Home here. 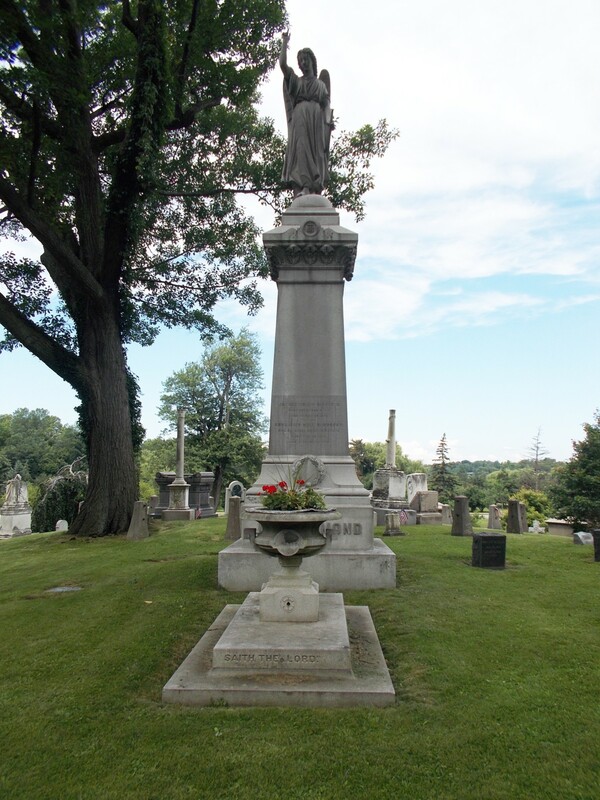 Mr. Jacob Koons died on May 9, 1889. Henry Koons was born in Buffalo on October 9, 1838 and was educated in the public schools. He worked for the American Express Company for two years. Henry then headed West to learn the trade of tanning with G. Pfisler & Company of Milwaukee, Wisconsin. He returned to Buffalo a few years later. He worked as a search clerk in the County Clerk’s office from 1865 to 1871, engaging in abstracting and tracing titles. During his time in the clerk’s office, he also started working in the real estate business. He set up his real estate shop on the 400 block of Main Street. On June 1, 1884, he formed the firm Henry & Edward Koons, when his brother joined the firm. Henry boasted that the reason for his success was that his guiding principle was absolute honesty in all business transactions. Edward Koons was born on October 1, 1861. He was a schoolmate of Francis Folsom, future wife of President Grover Cleveland. Edward read law in the office of William Glenney. His knowledge of law and real estate helped him to become a great success in the real estate business. He founded and was president of Abstract Title and Mortgage and was director of Buffalo Insurance for more than 50 years. He was the first Vice President of Buffalo Savings Bank and in 1920 became president of the Chamber of Commerce. 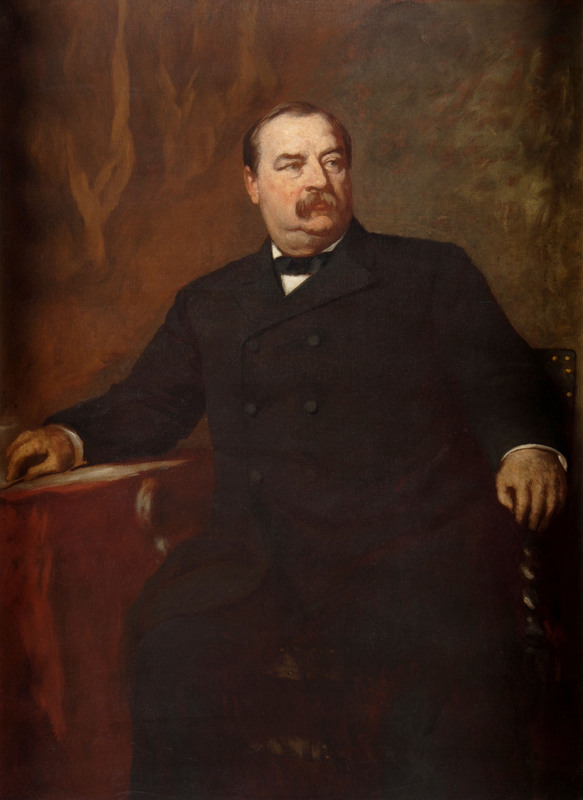 The brothers helped Grover Cleveland become Mayor by managing his campaign. They were prominent in his campaign for Governor and President as well. 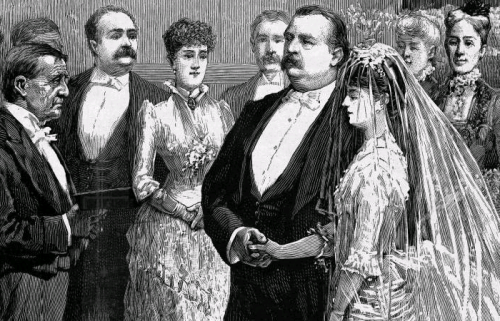 The brothers helped Grover Cleveland become Mayor by managing his campaign. They were prominent in his campaign for Governor and President as well. 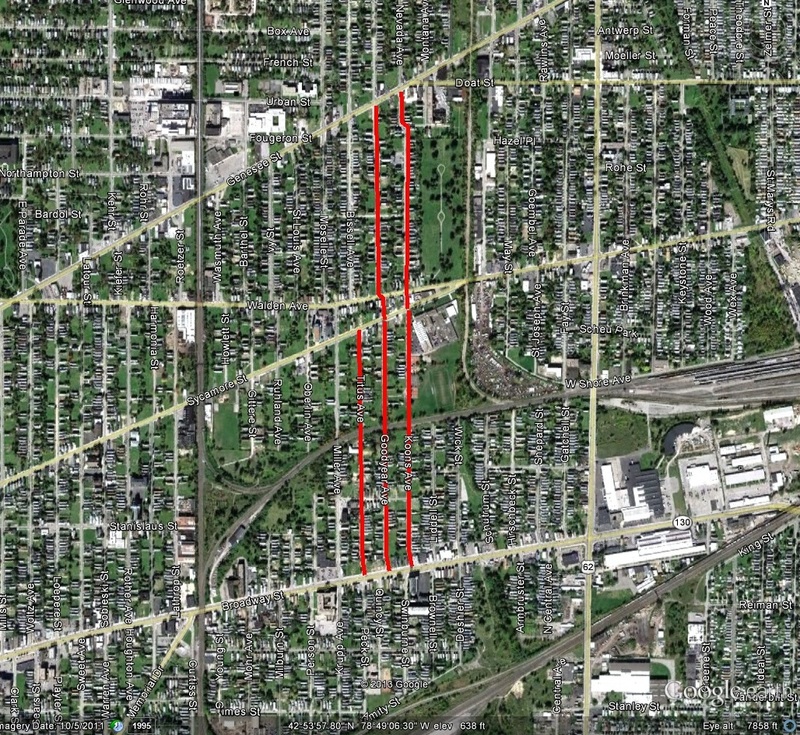 Edward and Henry, along with Judge Titus and Frank and Henry Goodyear, bought a large amount of East Side land and quickly resold it for development. In 1891, Edward opened the Erie County Guaranteed Search Company, an abstract and title search company. In 1906, Edward Koons was appointed a member of the commission to revise the City Charter. 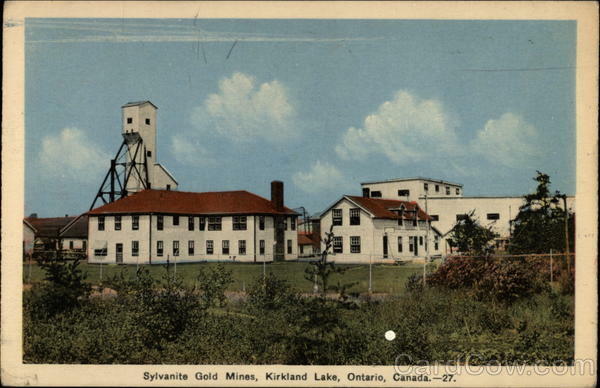 The Koons brothers invested their profits in gold mines in Ontario, calling their venture Sylvanite Gold Mines. Sylvanite is found in the Kirkland Lake Gold District in Canada. The mine was active until 1961. Henry Koons never married and died in April 1904 in Buffalo. Edward married Anna Hengerer, daughter of the founder of Hengerer’s Department Store. 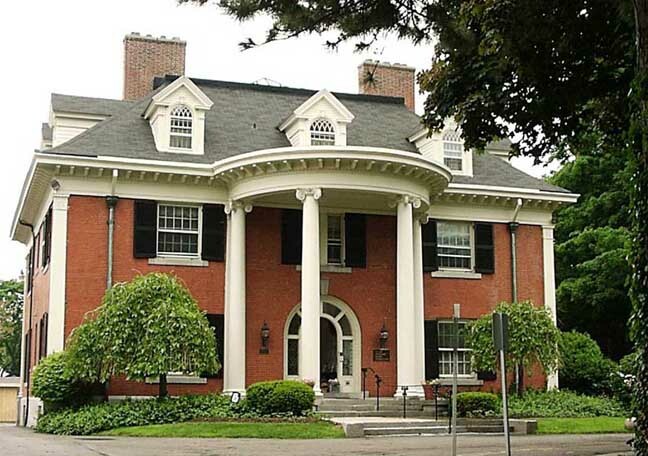 Edward and Anna lived at 1131 Delaware Avenue, which is commonly referred to as the Charles Germain House, after the first resident of the house. Edward Koons died at eighty-four in the Park Lane Apartments in February 1946. 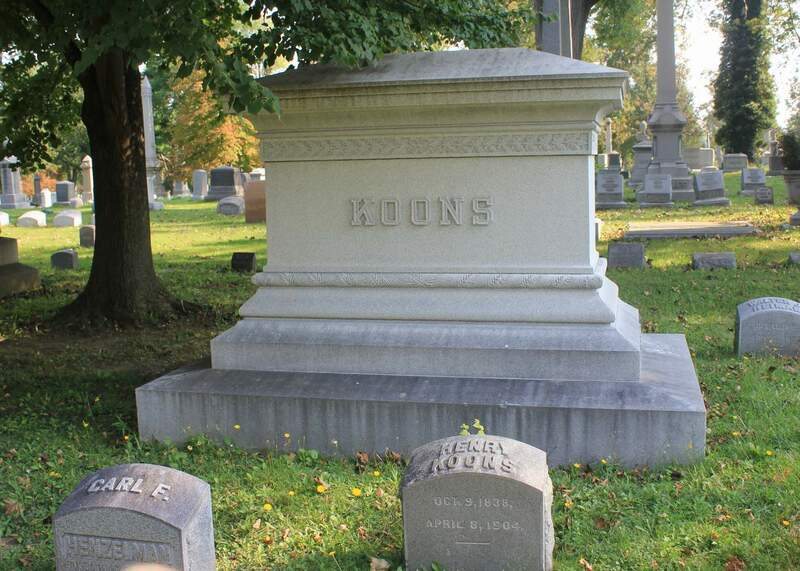 Edward and Henry are both buried in the Koons plot in Forest Lawn Cemetery. Learn about other streets in the Street Index. Our County and it’s People: A Descriptive Work on Erie County, New York. Edited by: Trumen C. White. The Boston History Company, Published 1898. Recalling Pioneer Days. Volume XXVI, Publications of the Buffalo Historical Society. Edited by Frank H. Severance, 1922. History of the Germans in Buffalo and Erie County. Reinecke & Zesch, Publishers. Buffalo NY 1898. 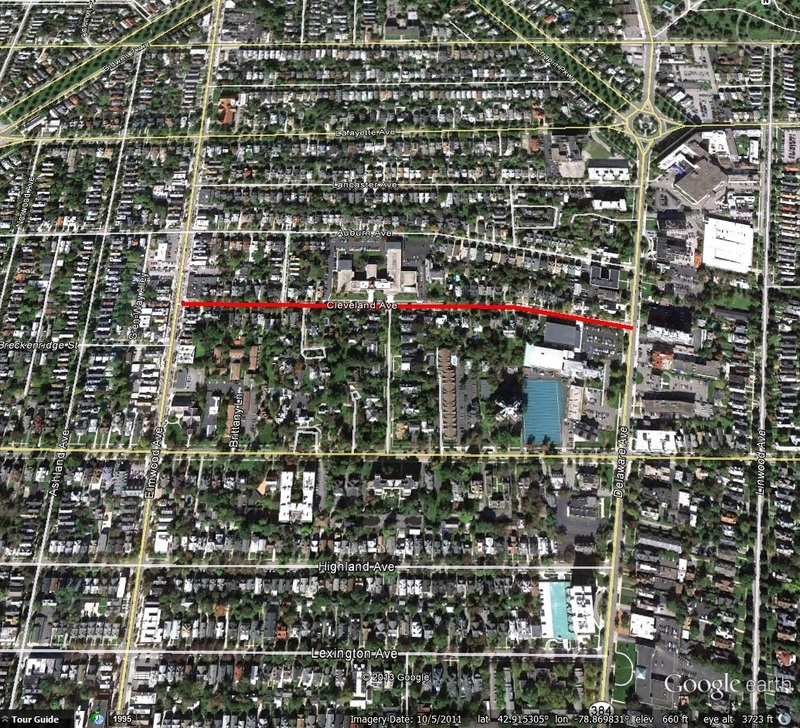 Goodyear, Titus, and Koons Avenue are three streets running between Walden and Broadway in the Emerson Neighborhood on the East Side of Buffalo. The streets were named after Charles Waterhouse Goodyear, his brother Frank H. Goodyear, Judge Robert Titus, Edward Koons, and his brother Henry Koons. These men entered into a partnership to subdivide and develop the streets and much of the land surrounding these streets. This post is going to focus on the Goodyear brothers, entries for the Koons Brothers and Judge Titus will follow shortly. Note: Buffalo’s Charles Goodyear is not the same Charles Goodyear that Goodyear tires are named after. Charles Goodyear of the tire fame invented vulcanized rubber around 1844 in Massachusetts. Charles Waterhouse Goodyear was born in Cortland, New York in 1846. He attended school in Cortland, Wyoming, and East Aurora, New York. 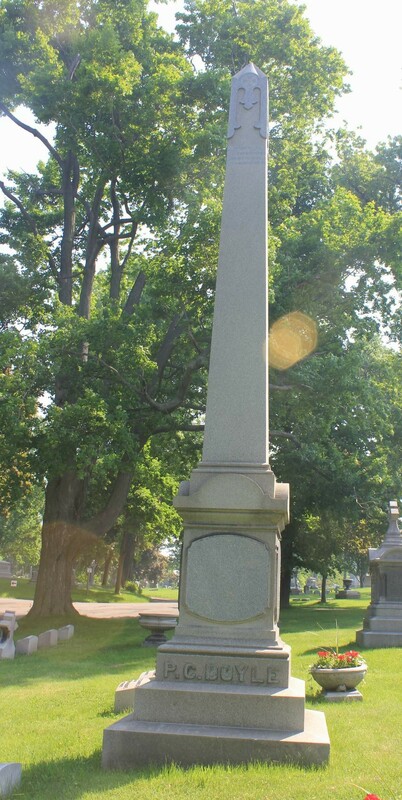 He came to Buffalo in 1868 to study law and was admitted to the bar in 1871. He joined Grover Cleveland’s firm of Cleveland, Bissell, and Sicard when Cleveland left to run for president in 1883. In 1887, Charles gave up law to enter into business with his brother to form F. H. & C. W. Goodyear. Together, Charles and Frank expanded the railroad and merged it with the Buffalo and Susquehanna Railroad from Buffalo to Wellsville. They profited by using the railroad to ship lumber, rather than floating it down streams, as was the practice of the time. Charles held the office of Trustee of the Buffalo Normal School, now known as Buffalo State College. He was also was one of the organizers of the Pan American Exposition and was President of the Buffalo Club. 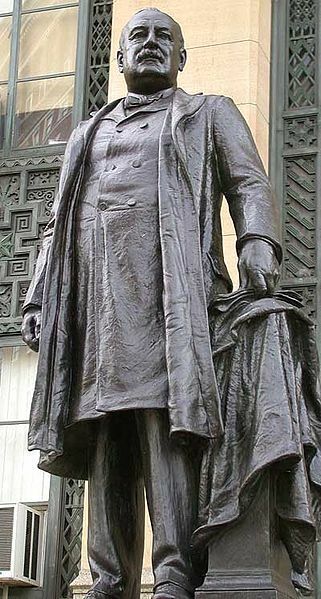 He was a close friend of President Grover Cleveland and Cleveland’s Secretary of State, Daniel Lamont. Charles and his wife were the first guests of President Cleveland at the White House. 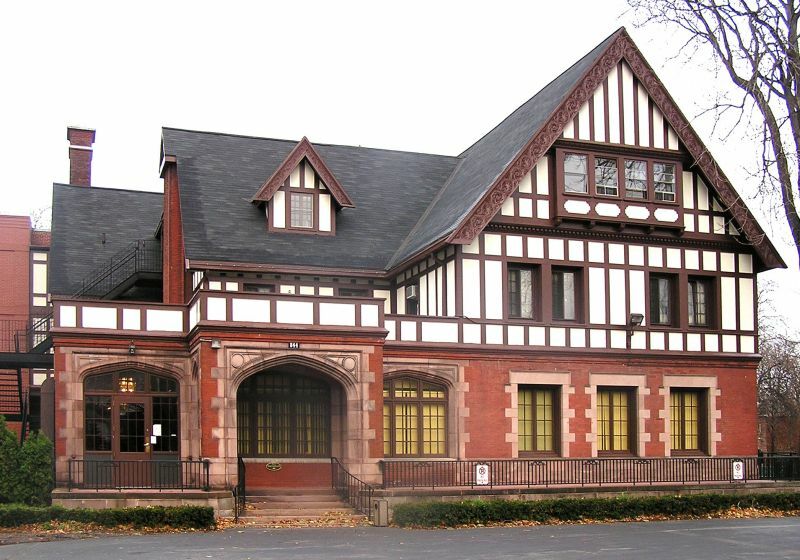 Charles and his wife Ella lived in a mansion at 888 Delaware Avenue, which was built in 1903 and designed by Green & Wicks. Charles died in 1911 and is buried in Forest Lawn Cemetery. Following Charles’ death, Ella established the Charles W. Goodyear Fund at the Albright-Knox Art Gallery. Charles and Ella’s son Anson Goodyear later served on the board of the Albright Art Gallery (now the Albright-Knox). Anson was one of the board members who insisted that the gallery begin to acquire modern art, of which the museum is now well-known. 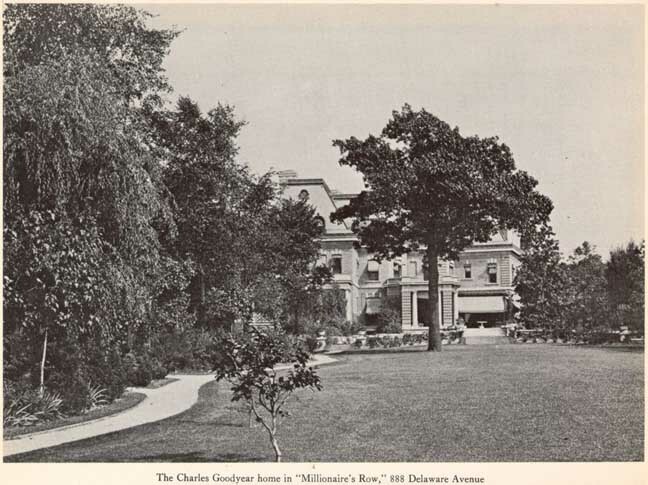 Ella lived in the Delaware Ave mansion until her death in 1940. At that time, the mansion was sold to the Blue Cross Corporation. The mansion was then sold to the Catholic Diocese of Buffalo in 1950 when it became Bishop McMahon High School. It was purchased in 1988 by Women & Children’s Hospital of Buffalo and was used as the Robert B. Adam Education Center. In 2005, Oracle Charter School purchased the building. In 1960, the family donated $500,000 to the University at Buffalo in Ella Goodyear’s name. This money was used to build Goodyear Hall on South Campus. 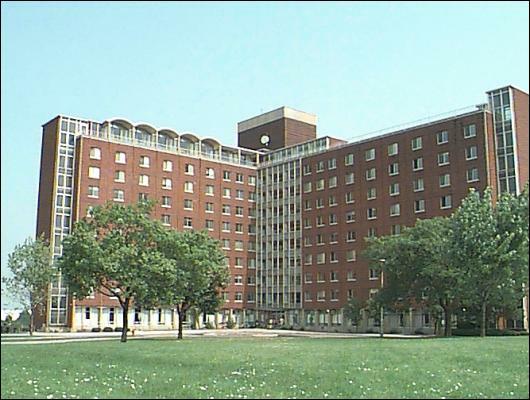 The building of Goodyear Hall was important to the development of UB towards becoming a residential college. Part of the UB2020 plan involves renovating Goodyear Hall and converting it from dormitory rooms into student apartments. Frank Henry Goodyear was born in Groton, Tompkins County, New York on March 17, 1849. Shortly after he was born, the family moved to Holland, New York. He attended public and private schools and the East Aurora Academy. In 1871, he moved to Buffalo to engage in the coal and wood business. He later entered the lumber business and was one of the largest lumber manufacturers in the United States at the time. His firm manufactured over 150,000,000 feet of lumber yearly. In 1884, Frank built the Sinnemahoning Railroad, which connected to the WNY&P Railroad in Keating Summit, Pennsylvania. In 1887, he entered into business with his brother Charles. Frank Goodyear built a mansion at 762 Delaware Avenue, at the northwest corner of Summer Street. 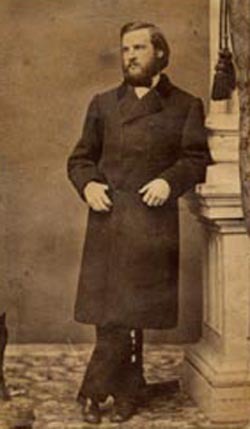 Frank passed away in 1907 of Bright’s Disease shortly after moving into the mansion. Frank made many donations to Buffalo parks. Frank’s wife Josephine lived in the house until she died in 1915. Following Josephine’s death, the house was lived in by Frank and Josephine’s son, Frank Junior. The mansion was demolished in 1938 and is now the site of the parking lot for the Red Cross. 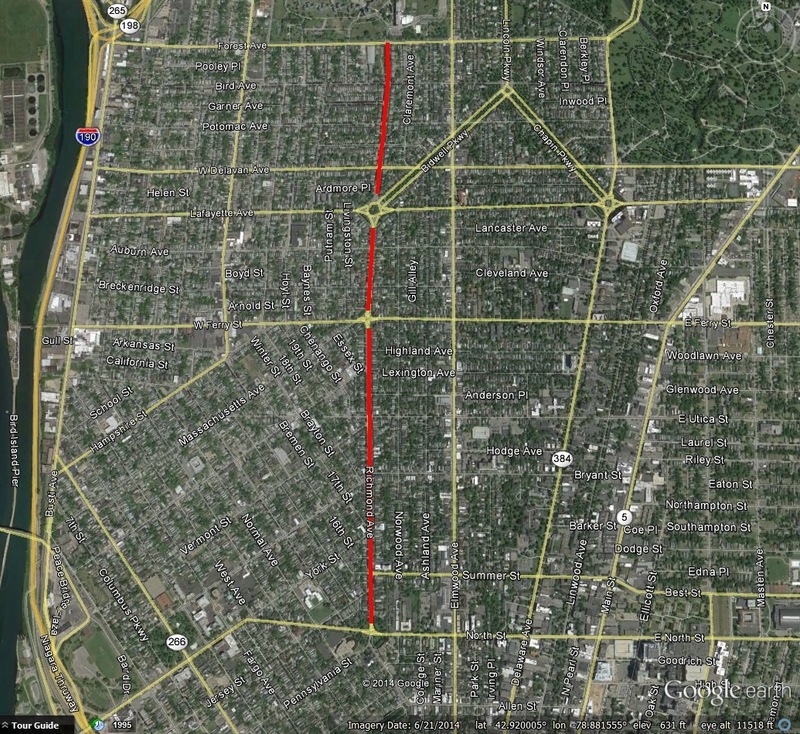 Don’t forget to check out the Street Index to learn about other streets. Dunn, Edward. Buffalo’s Delaware Avenue: Mansions and Families. Canisius College Press, 2003. 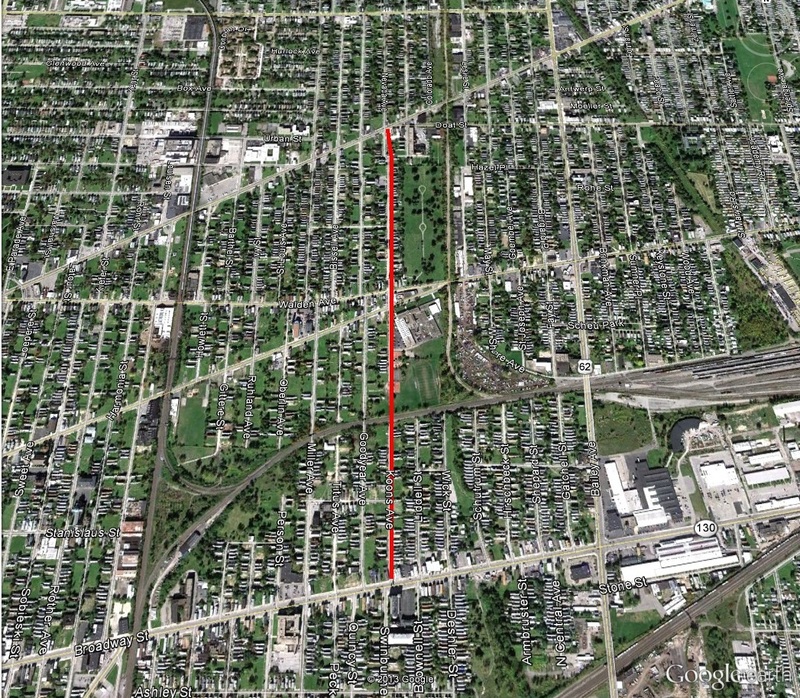 Is Curtiss Street named after Curtiss-Wright Airplanes? People often believe the street is named after Glenn Curtiss, known for Curtiss Aeroplane Company. 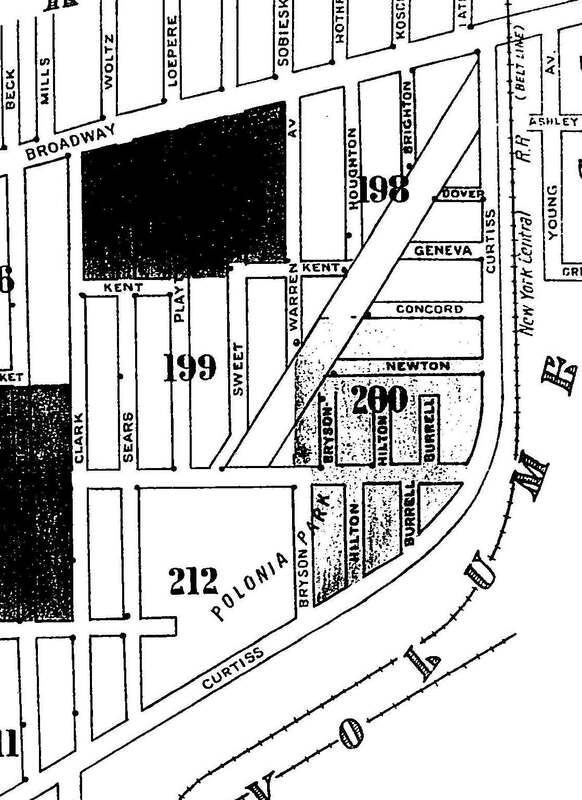 However, Glenn Curtiss wasn’t born until 1878, and the street was named by at least 1889. While it would have been very interesting if the street had been named in honor of an 11-year-old who ended up being as remarkable as Glenn Curtiss, this was not the case. I was unable to find any concrete evidence linking Glenn Curtiss to the other Buffalo Curtiss family. If anyone has any information of their linkage, please let me know in the comments. 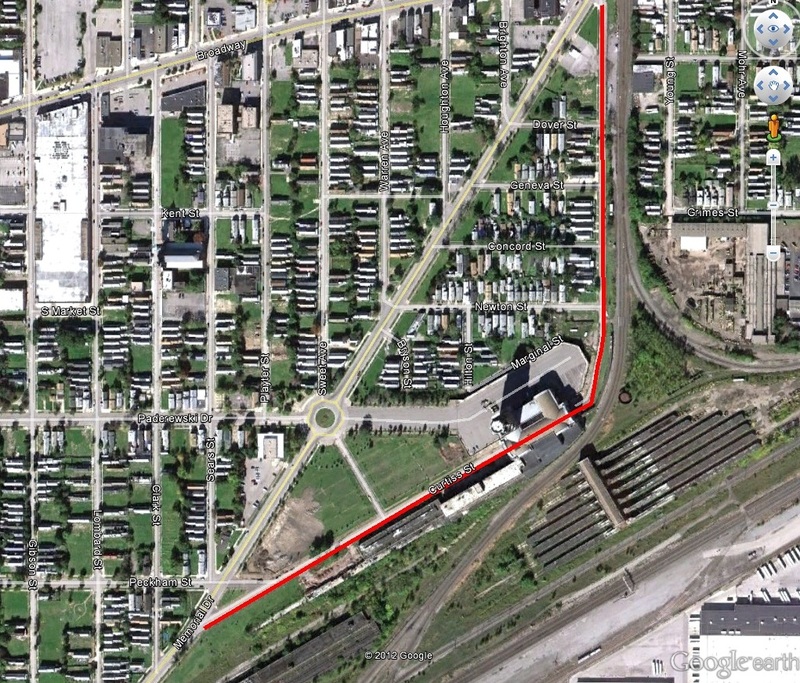 But no, Curtiss Street is NOT named for Curtiss-Wright airplanes. Curtiss Street is named for Charles Gould Curtiss. 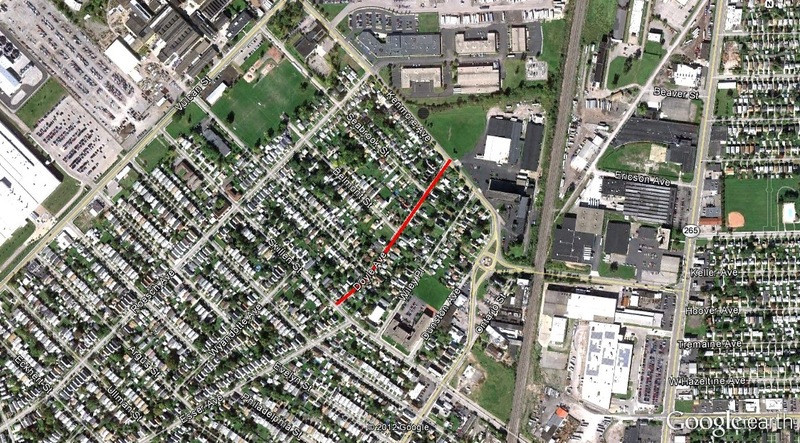 Mr. Curtiss was an officer of the Lancaster and Depew Land Company, which developed Curtiss Street and several other streets in its vicinity. Mr. Charles Gould Curtiss was born in 1827 and grew up in Utica, New York. He ran the news stand at the Utica Rail Station while he was a boy, and eventually became a produce salesman. At the age of 23, he formed a connection with a wholesale grocer, which brought him to New York City. He made many connections while in New York. For a short time, he became an executive of Breckinridge County Coal Oil Company in Louisville Kentucky. He worked to substitute coal oil for sperm oil. The discovery of petroleum caused the business to fail, as the coal oil was no longer necessary. In 1857, Mr. Curtiss came to Buffalo to join Levi Willard in the insurance business. In 1873, he organized a barley and malt firm that continued to operate for nearly half a century. 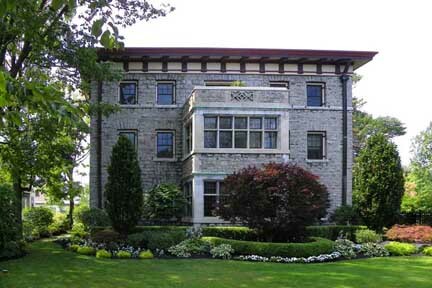 Charles and his wife Amelia lived in a large stone house at 63 West Huron Street. 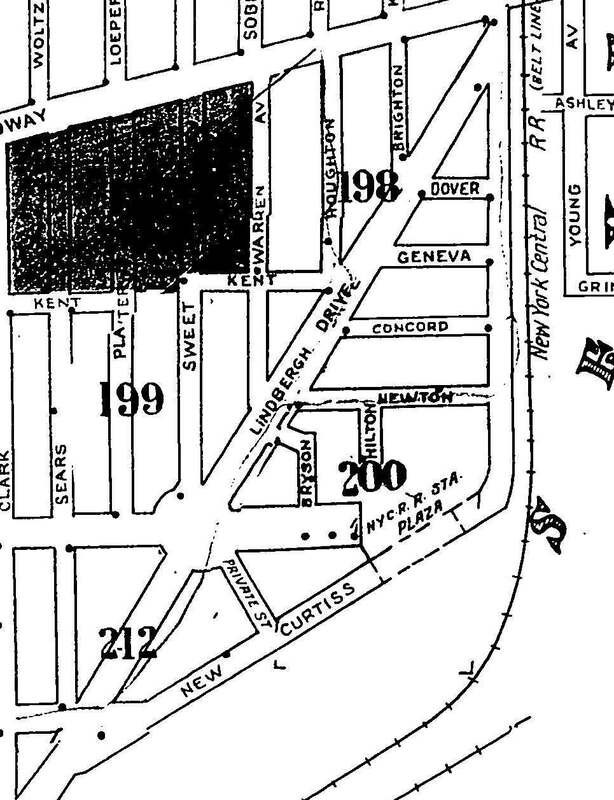 He kept his horses at Efner’s Livery Stable at Franklin and Chippewa, and it is said that he rode his horses through Delaware Park on a daily basis. At the time, the roads were only paved as far as North Street, so riding to the park was a ride out to the country. In 1882, Charles was a delegate to the Democratic Convention where his friend Grover Cleveland was nominated for Governor. 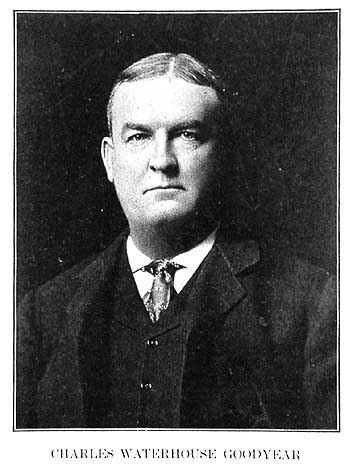 After his election, Cleveland appointed Mr. Curtiss to the Board of Trustees of the Buffalo State Hospital for the Insane. The Curtiss family also kept a farm at Delavan and Main Street where he raised chickens and kept a cow. He felt that “the country was the best place for growing boys”, so he spent a great deal of time on the farm with his sons Harlow and Alexander. Although his own schooling was limited, Charles felt an education was important, so he sent both sons to college. Alexander studied medicine at the University of Rochester after coursework at Cornell. 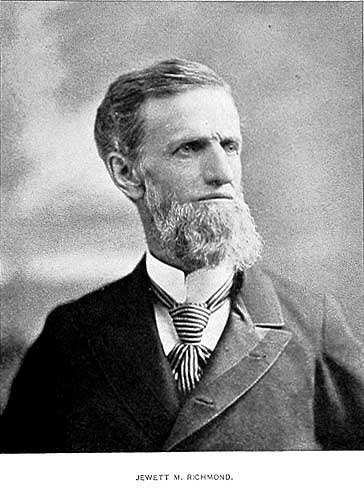 Dr. Curtiss (Alexander) was in charge of the first hospital established in Denver, Colorado. Following the birth of his first son, Colman, Dr. Curtiss returned to Buffalo and became a surgeon for Buffalo State Hospital. Colman eventually ran his grandfather Charles’ barley and malt firm. Colman was president of the company when it went under due to prohibition. Following the closure of the malt firm, Colman worked in insurance for John Hancock Life Insurance Company. 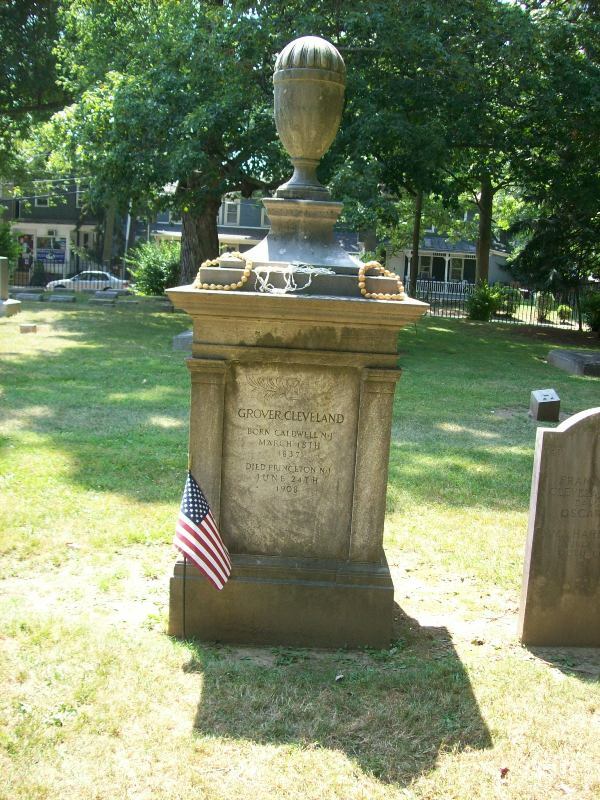 Colman married Sally Cary, daughter of Trumbull Cary (another prominent Buffalonian). Alexander and his family lived at 780 West Ferry, the house which is better known today as the Ronald McDonald House. Harlow was a graduate of Trinity College in Hartford, Connecticut and studied law under Grover Cleveland. Harlow became a lawyer and became an extensive real estate owner throughout the City. Harlow and his wife Ethel were prominent in Buffalo during the early 1900s. 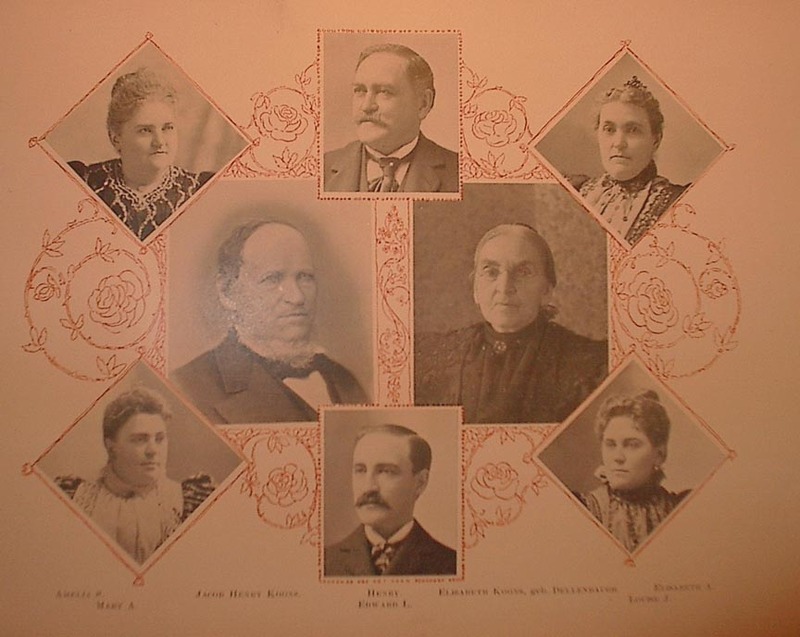 Ethel was originally Ethel Mann, the daughter of Matthew Mann, the doctor who operated on President William McKinley after he was shot on the Pan-Am grounds in 1901. 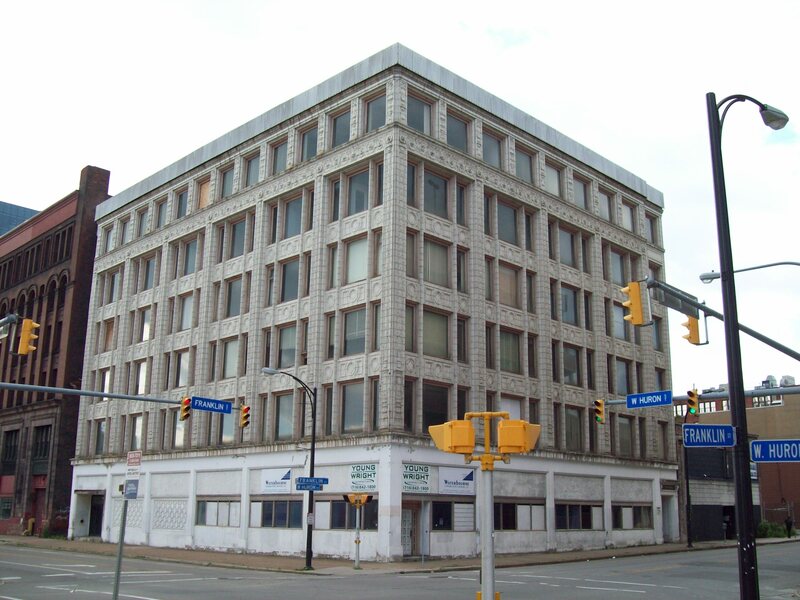 Harlow was influential in the development of the Curtiss Building at the corner of Franklin and Huron. Ethel was considered a community leader as well, she worked with the Buffalo Council of Campfire Girls and conducted programs to develop leadership skills for women. Ethel and Harlow lived at 100 Lincoln Parkway. The Curtiss Building at Franklin and Huron Streets was designed by Harlow’s brother-in-law, Paul Mann, and was built in 1912. The building is also known as the King & Eisele Building due to a jewelry firm which located in it during the 20s and 30s. It was later known as the Hoelscher Building after the Hoelscher Building Corporation which was located there from the 1940s until the 1990s. Mark Croce currently owns the building and had plans for a boutique hotel about 5 years ago. However, the project appears to be at a standstill. 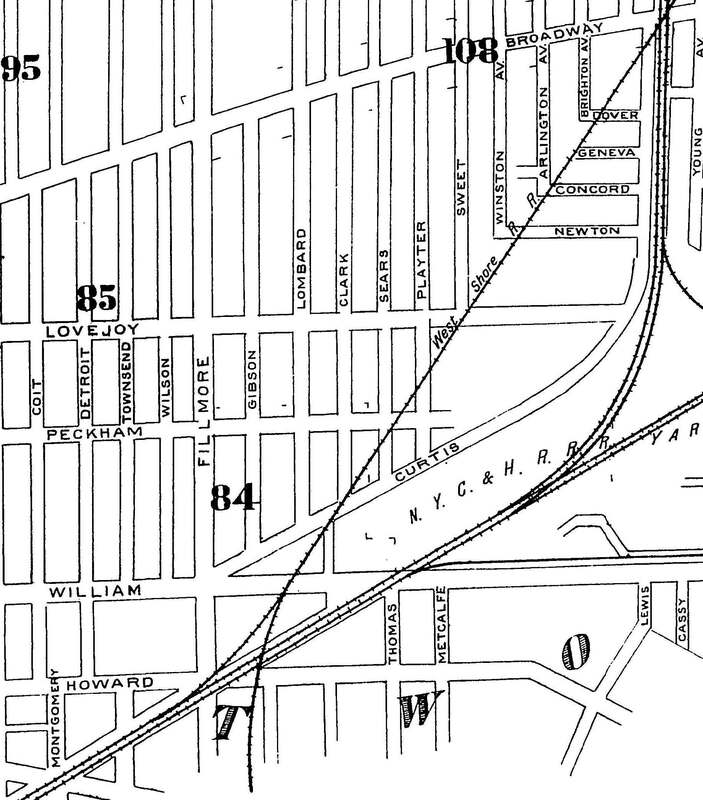 COMING SOON: I became intrigued by the old maps when I saw the land where the Central Terminal now sits was once a park. Coming later this week: What was Polonia Park? Sources: “Curtiss Street Memorial to Trade Board Head, Developer” Courier Express Oct 22, 1939 sec. 6. p 10.